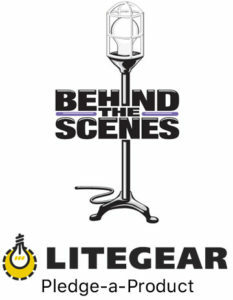 LiteGear showed the benefits of their new CineMitter series of applied phosphor LEDs. 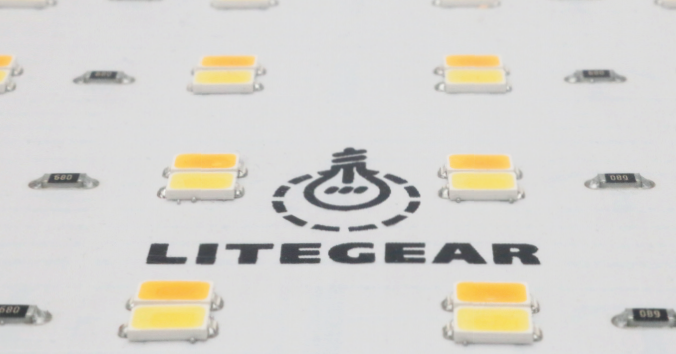 Exclusive to LiteGear, these new emitters set the standard for cinematic, color-correct LED lighting. 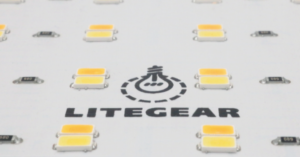 Efficient, and full-spectrum, these LED chips offer state-of-the-art output with a 40% increase in brightness over VHO Pro. Another distinct feature of the CineMitter is the extended Kelvin range. 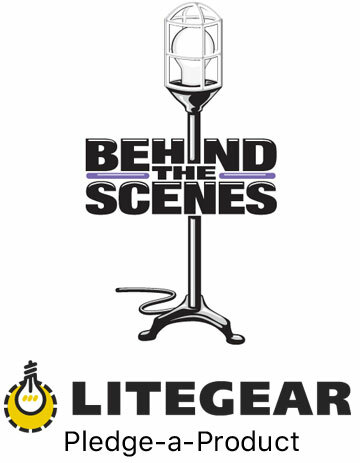 LiteGear pushed the lower CCT to 2600 degrees Kelvin (K) allowing for candlelight or deep-tungsten output while increasing the CRI to a staggering 95+ — that’s nearly indistinguishable from traditional incandescent sources! On the cool side, the CCT was pushed up to 6000K to better balance for overcast sky or cool white fluorescents. This increase in CCT still achieves a CRI of 95+ and provides beautiful, full-spectrum daylight. CineMitter is now standard on LiteMat S2, LiteMat+ Plus, LiteTile — and coming soon to LiteRibbon. Speaking of LiteMats, the new LiteMat+ Plus series of LED light fixtures is the ideal luminaire for set lighting and rental company inventories. LiteMat+ Plus incorporates everything you love about LiteMat, features the new CineMitter, and adds some distinctly new features. 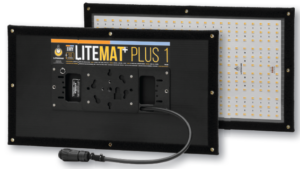 The most notable change is the PL7 locking connection system, which happens to be the same for every size of LiteMat+ Plus, and the new LiteDimmer+ Plus series of dimmers with built-in camera battery mounts. LiteDimmer Universal is a professional, cinema-grade, icker-free, LED DMX dimmer. This standard capacity (8A total), o ers both manual and remote dimming in one. 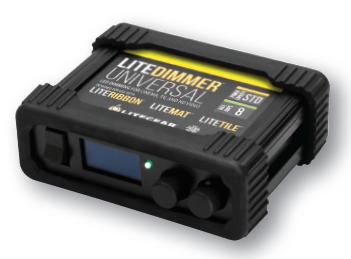 The LiteDimmer Universal is designed to work with Single, Hybrid, RGB, and RGBW/A LiteRibbon, has an operating voltage from 12VDC to 48VDC, and allows for adjustable PWM. 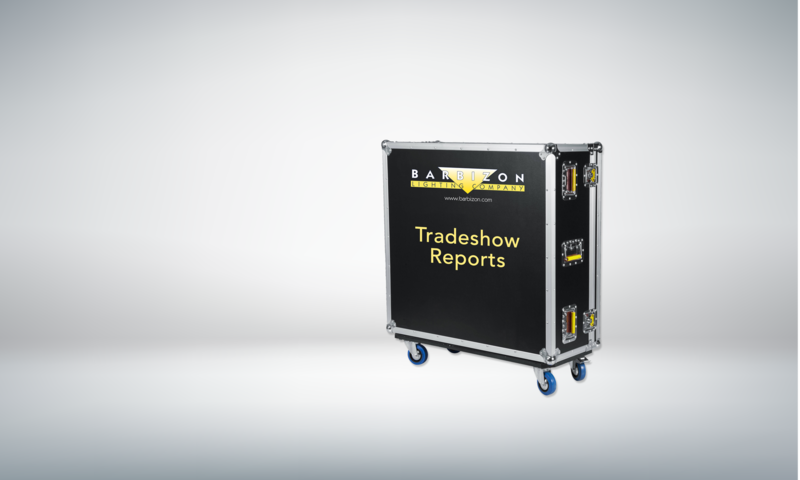 LiteDimmer Universal-W offers all of the same features of the Universal dimmer but adds the feature of built-in wireless DMX. Using genuine LumenRadio CRMX technology ensures compatibility with LumenRadio CRMX and Wireless Solution W-DMX transmitters. LiteGear also presented a check for $7750 representing a percentage of the profits from sales of their new flagship fixtures, LiteMat+ Plus, to support the Behind the Scenes Charity.